The 120GB Extreme Pro CFast 2.0 Memory Card from SanDisk features enhanced data read speeds of up to 450 MB/s and data write speeds of up to 350 MB/s. The enhanced data read and write speeds make this the go to memory card for a variety of tasks such as Full HD and 4K video recording. This CFast 2.0 memory card has also been designed to withstand extreme temperature conditions from 23 to 158°F (-5 to 70°C). With data-write speeds of up to 350 MB/s and data-read speeds of up to 450MB/s, the 120GB memory card can keep up with the burst-mode shooting of professional-grade cameras and camcorders. It also saves you time when moving large image or video files from your camera to your computer. 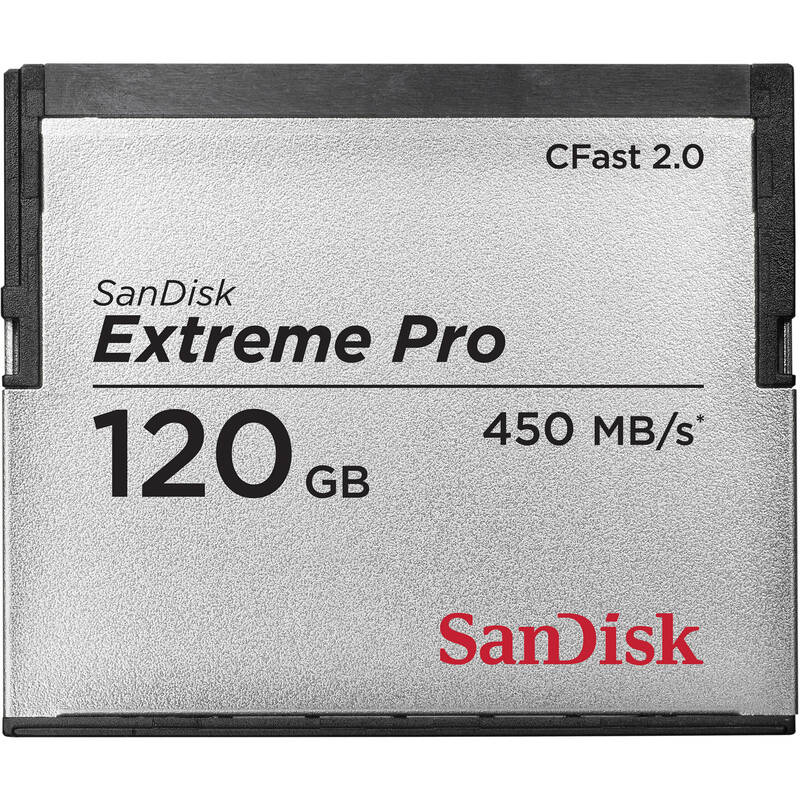 The SanDisk Extreme PRO CFast 2.0 offers the speed required for enhanced high-resolution video. This card is compatible with a variety of high-performance cameras and camcorders based on CFast 2.0 technology. Built for the demands of professionals in the broadcast, cinema, and photography industries, this memory card offers the workflow efficiencies needed to stay competitive. This memory card can operate in temperatures ranging from 23 to 158°F (-5 to 70°C). Box Dimensions (LxWxH) 3.0 x 3.0 x 0.5"
Pl tell can a CFast 2.0 be used in lieu of CF card, like NIkon D800? Will it increase D800 or D300 buffer capacity of 18 RAW pictures to more pictures in a burst?